How is it that a guild and a players GP is the key factor in TW and Grand Arena? Why should a player or guild be put at a disadvantage because they have worked on building up more of their roster? 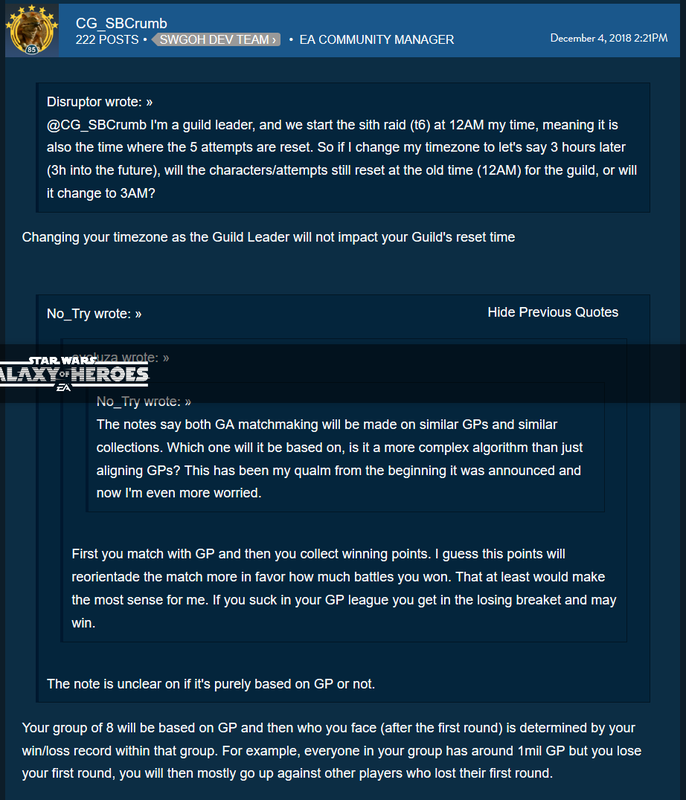 It would appear to me that matching players/guilds based on their GP was the easy way for CG to determine matchmaking. The Easy way is not always the best way. The matchmaking criteria certainly needs a major overhaul and quick. Didn’t we pretty much already go over this with “Paper” zombie? Not going to quote CG but will post a screenshot from their own post below. Posting just one screenshot of many from a Discord chat and also a screenshot from the CG post about “Paper” zombie and how not leveling up characters goes against the way the game was intended. @EA @CG are you guys going to keep your word about going with the spirit of invest in characters as it is a core pillar? This is a situation i'm currently in. 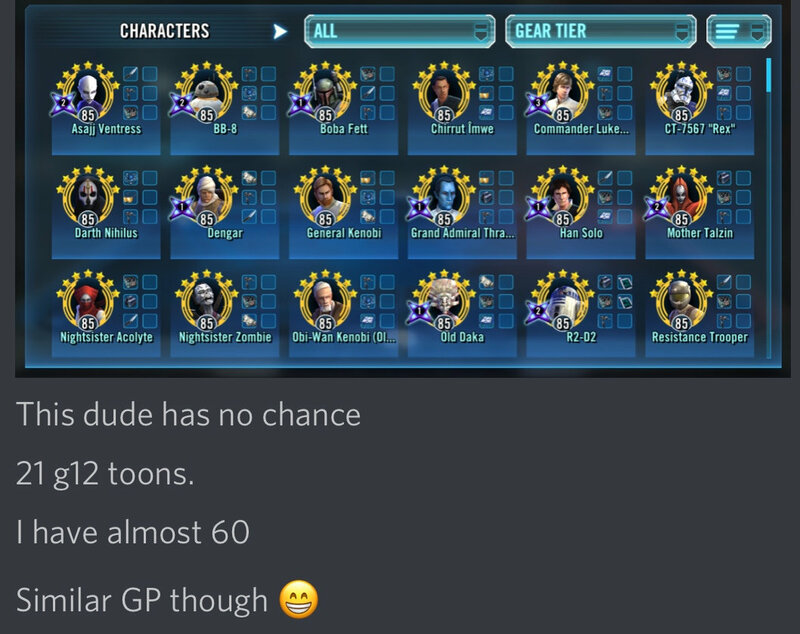 My GP is scaled high because of lowbie trash toons and their stars, not actual G12s or relative power. It in tally makes my total higher, but this type of matchmaking provides guaranteed losses. Peoples priorities are different. I play for love tw/ arena first. Raids 2nd. Then tb etc last. My roster is built for that. I don't really "work" on toons til I can reach high gear. Or have a team ready. I also seldom use a zeta unless 7 star g12 with few exceptions ie traya at 5 star. So a tb oriented/collector will get murdered. Also keep in mind they likely cannot get to complicated in matchmaking. Gp is usually a fair assumption. You will win some lose some. But could you imagine how complicated it would be to try to take into account all aspects of an account for even matching? We have no idea whether there are additional factors in the matchmaking formula.....I seriously doubt it's solely based on GP. Also, everyone should expect the matchmaking formula to get tweaked over time. It's all in a guilds focus there if you want max stars asap in tb it will hurt you in tw. Or vice versa. My guild does awesome in tw and can punch above our weight class. We're likely in the next tb or 2 finally gonna hit perfect. Its not **** its all choices. Find a like minded guild and go with it. Same goes for your own account. You need to choose your path and do what you want for your style. My Grand Arena matchup was great. However, since I am in a guild currently that didn’t work on “fluff” we win every TW and usually clear a board in 2-3 hours. It’s never even close. Sure the 3 zeta mats are nice but it’s pretty boring. Some players want a challenge, not just easy rewards while other players would like a decent chance to earn those rewards. I am not speaking for myself per say when I say having “fluff” count against a player/guild is a bad thing. My roster is up to par when it comes to the top characters/ships in the game. I can compete with pretty much anyone, except for the games top Krakens I am guessing. Yeah, I ended up with a pretty even match-up. Our GP is only 20 points apart, G12 characters are 13 to 11, and neither of us has Revan or Traya yet. Kyno even you should know this algorithm is horrible because Ships over-inflate GP by a milestone. Someone farming Hounds Tooth will end up facing someone who didn't focus hard on ships. Character GP is more important since that is where the win/loss of Grand Arena will be judging from the points distribution. I'd add "ownership of Revan" to that list. I don't currently have anything that can take a strong Revan team down, so if someone puts him on defense, I'm boned. No one in their right mind would put these to differing runners in the same category. So your example proves the point you are arguing against. No player/guild should have an advantage over other players that are unlocking and spending resources on their characters/ships, plain and simple just because they aren’t. Makes no sense. Shouldn’t matter if those players are meta or not. In fact, it should be the complete opposite imo. It’s like CG is telling players not to spend. Not to level up chars unless you absolutely need them. Players should be rewarded for building up their rosters. Seriously, we all know the tragic story of Paper zombie. Why should GP matchmaking be any different. Yeah, I’m gonna get killed in my matchup because of my collector focus. If we were posting more than six squads, my depth might shine through, but as it is, I don’t expect to do well in this mode. Just a suggestion: in my GP range, both sides post 6 D squads. For simplicity’s sake, let’s suppose we’ll both use 6 squads on offense. That’s 12 total squads, 60 total characters. Maybe a fairer way to do the matchmaking would be to look at the total GP of each player’s top 60 toons? Or something like that. I think whichever way you do it youll get complaints. If someone worked really hard on their roster and was only putting resources into things, managing them carefully. He has put a lot of thought into his roster. why should he have to go up against someone who didnt put up as much effort, but simply had the game longer and so has much more resources (because that person will have similar gear 12, but lots more lower down). This is the best argument for the existing system. The only thing is that I think the point of the matchmaking should actually be to create a pairing in which both sides actually have a chance, and provide a challenge for each other. Instead, the system as it seems to be working is going to create a permanent class of winners and losers, and occasionally, almost by accident, create a fair pairing. In ONE game mode. TB rewards you for leveling all characters and penalizes players that don’t. This is the inverse of that. Both types of players have a game mode tailor-made for their style of collection and focus. It’s ok to have both kinds of modes. the category is olympic runners. just like the category for this matching is players of SWGOH. how each runner trains is how each player develops their roster. if you want to be good at TW/GA you need to be team and counter team focused. if you do this the rest takes care of itself. we dont know all the factors involved, we dont know if GP is anything considered, or if they use just character GP. so stating it is horrible is a little unfair. Where? you added the link after i wrote this. I will ping him for clarification on that. because overall post on GA, sounds different than that. This is what i have seen about matchmaking. it sounds like they are using the TW matching system. just tuned to 1 player. Umm... I think that "similar collection" part is broken. from what I have seen this looks like a straight up gp paring. If we knew this game mode was coming yes, otherwise how is it anyone's fault , thet didnt prepare for something they knew nothing about. There were no hints , no login toons that pointed to this. Introducing another game mode that punishes collectors in a collector game us just silly. Which is why i'll put one toon on defense and be done with it. Will not waste a second on a game mode that punishes me because of how i choose to play a game. 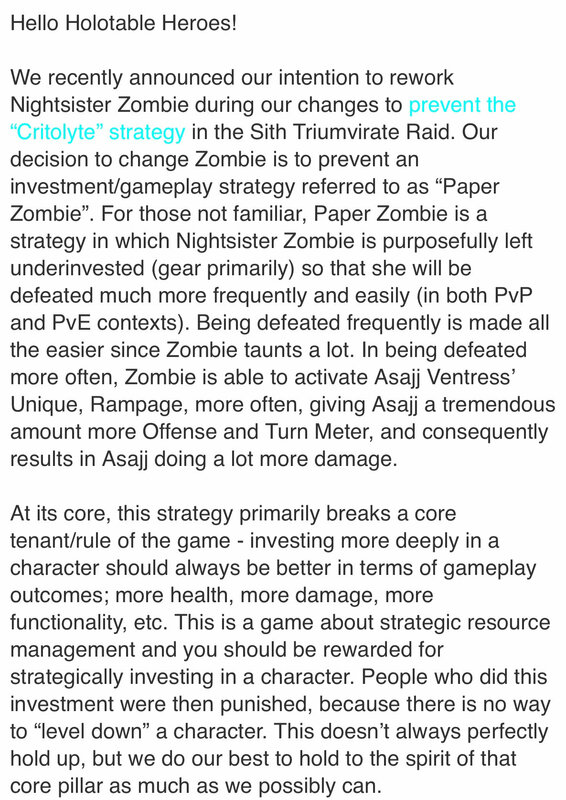 And lastly zombie was changed because they didn't want ppl gaining an advantage for not powering up toons , well you just created a game mode , that will stop the powering up of all non meta toons , to keep gp low to face much easier opponents. Does not make much sense. And as far as i know total GP also includes ships even though none can be used. Which is another handicap to those who actually use and worked on a bunch of ships. I posted a comment in GA mega, and posted here (pending approval). My take on this is that that GP is bundled rather than matched on separate criterias of Ship GP and Toon GP. Also, ship GP is overly inflated in comparison to Toon GP. In a competiton thats based heavily on characters themselves while pairing based on GP, a hugely inflated ship gp(counts for roughly 1/2 of a players gp, yet only pertains to of 1/3 GA? and 1/5 of TW event) hurts the players invested in ship arena without rewarding them in PvP events. While players who are not invested in ship arena/ships, have no handicap of this sort in any PvP event. Basically scale ship GP better, or match on two separate GPs if GP is the matching factor. Its absurd to know that having ships becomes a handicap overall. Ships will be used in some of the later Grand Arena tournaments but I obviously agree 100% with everything else you said. A long distance runner and a sprinter train differently because they are competing in two completely different events. They dont have to and won’t face each other.